Los Angeles Drive, Inc. is offering a maximum of 95,000 Shares on a “best efforts” basis without a minimum investment target. Provided that an investor purchases Shares in the amount of the minimum investment (one Share), there is no minimum number of Shares that needs to be sold in order for funds to be released to the company and for this offering to close, which may mean that the company does not receive sufficient funds to cover the cost of this offering. The offering will terminate at the earlier of: (1) the date at which the maximum offering amount has been sold, (2) the date which is one year from this offering being qualified by the Commission, or (3) the date at which the offering is earlier terminated by us in our sole discretion. We may undertake one or more closings on a rolling basis. After each closing, funds tendered by investors will be available to us. Following the offering, the Company will be subject to the reporting requirements pursuant to Rule 257(b). Los Angeles Drive, Inc. is one of 12 Delaware corporations formed to represent teams (each a “Team” or collectively, “Teams”) in a national fantasy sports football league (“The Crown League”) which is to be operated by The Crown League, LLC, a Delaware limited liability company (“CRL”), the managing member and substantial owner of which is CrownThrown, Inc., a Delaware corporation (“CrownThrown”). CRL intends to launch the first publicly owned, professionally managed, national fantasy sports league. 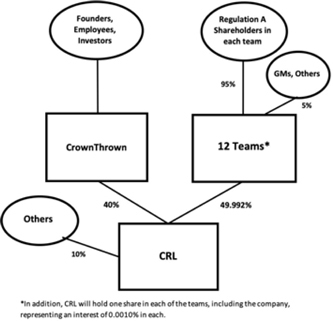 CRL has two classes of membership interests: 49.992% of the membership and voting interests are controlled by the Class A members, all of which are held, in equal amounts, by us and the additional 11 companies that anticipate competing in The Crown League (in other words, each company Team will initially own 4.166% of the interests in CRL), and the remaining 50.008% of membership interests in CRL will be held by the Class B members of CRL, approximately 90% of which is currently held by CrownThrown. As of March 5, 2019, only one share had been issued by the company, at par, and it is held by CRL. Immediate dilution to investors in this offering will therefore be non-material. • In June 2014, Ben invests $20,000 in shares that represent 2% of a company valued at $1 million. • In December, the company is doing very well and sells $5 million in shares to venture capitalists on a valuation (before the new investment) of $10 million. Ben now owns only 1.3% of the company but his stake is worth $200,000. • In June 2015, the company has run into serious problems and in order to stay afloat it raises $1 million at a valuation of only $2 million (the “down round”). Ben now owns only 0.89% of the company and his stake is worth only $26,660. As compensation for the services listed above, the Company has agreed to pay a 1.2% commission on the amount invested by investors not solicited by NCPS and a 6% commission on the amount invested by investors solicited by NCPS. The Company has been authorized to pay NCPS an accountable total of $32,000 due diligence expense with respect to this offering and the offering by the other 11 Teams (the “Collective Offerings”). Such advance will be reimbursed to the Company to the extent such expenses are not actually incurred. The Company has agreed to pay NCIT, an affiliate of NCPS, $500 per month for basic licensing and service of technology to support the Offering, up to a cap of $6,000 for the Collective Offerings. The Company has agreed to pay $500 to the Escrow Agent to set up the escrow account for each Team. It is anticipated that NCPS’s activity on behalf of the Company will be conducted by registered representatives, and a portion of the sales commission received by NCPS will be paid to those registered representatives. North Capital Private Securities Corporation of Delaware (“NCPS”) will serve as escrow agent in accordance with Rule 15c2-4 of the Securities Exchange Act of 1934, as amended. Investor funds will be held in a segregated bank account at an FDIC insured bank pending closing or termination of the Offering. All subscribers will be instructed by the Company or its agents to transfer funds by wire or ACH transfer directly to the escrow account established for this Offering or deliver checks made payable to “NCPS / LOS ANGELES DRIVE, INC.-Escrow Account,” which will be promptly deposited into such escrow account no later than noon the next business day after receipt. The Company may terminate the Offering at any time for any reason at its sole discretion. Investors should understand that acceptance of their funds into escrow does not necessarily result in their receiving shares; escrowed funds may be returned without interest. Los Angeles Drive, Inc., was incorporated on February 21, 2019 (“Inception”), in the state of Delaware. Our headquarters are located in Park City, Utah. We are one of 12 Teams within The Crown League fantasy sports football league. Set forth below is information regarding the beneficial ownership of our shares, as of March 5, 2019, by (i) each person whom we know owned, beneficially, more than 10% of the outstanding shares, and (ii) all of the current officers and directors as a group. We believe that, except as noted below, each named beneficial owner has sole voting and investment power with respect to the shares listed. Unless otherwise indicated herein, beneficial ownership is determined in accordance with the rules of the Securities and Exchange Commission, and includes voting or investment power with respect to shares beneficially owned. CRL has two classes of membership interests, including, (1) Class A Membership Interests which represent 49.992% of the outstanding membership interests in CRL, all of which are held, in equal amounts, by us and the additional 11 companies that anticipate competing in The Crown League (in other words, each company Team will initially own 4.166% of the aggregate membership interests in CRL), and (2) Class B Membership Interests which represent 50.008% of the outstanding membership interests in CRL, all of which are held by CrownThrown and certain other members. Set forth below is information regarding the beneficial ownership of CRL’s membership interests, as of March 5, 2019, by (i) each person whom we know owned, beneficially, more than 10% of the outstanding membership interests, and (ii) all of the current officers and managers as a group. We believe that, except as noted below, each named beneficial owner has sole voting and investment power with respect to the membership interests listed. Unless otherwise indicated herein, beneficial ownership is determined in accordance with the rules of the Securities and Exchange Commission, and includes voting or investment power with respect to membership interests beneficially owned. Set forth below is information regarding the beneficial ownership of CrownThrown, as of March 5, 2019, by (i) each person whom we know owned, beneficially, more than 10% of the outstanding voting stock, and (ii) all of the current officers and directors as a group. We believe that, except as noted below, each named beneficial owner has sole voting and investment power with respect to the shares listed. Unless otherwise indicated herein, beneficial ownership is determined in accordance with the rules of the Securities and Exchange Commission, and includes voting or investment power with respect to shares beneficially owned. Our authorized capital stock consists of 200,000 shares of common stock, $0.0001 par value per share. As of March 5, 2019, we had 1 share of common stock outstanding all held by CRL. We have audited the accompanying balance sheet of Los Angeles Drive, Inc. (the “Company”) as of February 21, 2019, and the related notes to the balance sheet (financial statement). In our opinion, the financial statement referred to above presents fairly, in all material respects, the financial position of Los Angeles Drive, Inc. as of February 21, 2019, in accordance with accounting principles generally accepted in the United States of America. Los Angeles Drive, Inc. was formed on February 21, 2019 (“Inception”) in the State of Delaware. The balance sheet, and related notes (collectively the “financial statement”) of Los Angeles Drive, Inc. (which may be referred to as the "Company", "we," "us," or "our") is prepared in accordance with accounting principles generally accepted in the United States of America (“U.S. GAAP”). The Company’s headquarters are located in Park City, Utah. The Company has evaluated subsequent events that occurred after February 21, 2019 through March 5, 2019. There have been no other events or transactions during this time that would have a material effect on the balance sheet.